When it comes to astrophotography tools, there are four essential items you need for photographing the night sky: an astrophotography camera – that is, a DSLR or mirrorless camera that allows you to open the shutter for at least 30 seconds; a tripod; RAW format photos to spruce-up in Photoshop later; and great timing. 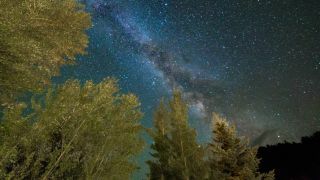 The latter is imperative if you want to photograph the night sky and catch specific celestial events like the Perseid meteor shower, or phenomena such as the Milky Way (which is best photographed in summer) or the Northern Lights (in winter). However, the camera you use for astrophotography does make a difference, as do the lens and tripod. There are also various other handy camera accessories that will allow you to experiment with nightscapes and take your images to the next level, and if you're getting way out into the countryside to escape all the urban light pollution, you might want to take a look at our list of the best camera backpacks. In terms of specialist astrophotography equipment for 'deep sky' images of star clusters, nebulae and galaxies, the list is endless (and very expensive) and becomes dependent on having good quality telescopes. That's verging on astronomy, so we've concentrated here on good value astrophotography gear that the average photographer could consider for obtaining unique astro-landscape shots without going to huge expense. Here's our pick of essential astrophotography tools to take your night sky photos to the next level. Do you need a full-frame camera to take images of the night sky? No, you don't. Crop-sensor cameras work well enough for astrophotography beginners – and are absolutely fine for photographing nightscapes and the Northern Lights. However, at some point most photographers want that one thing that only a full-frame sensor can properly capture: the Milky Way. With a 26.2MP Dual Pixel CMOS AF sensor and ISO 40,000 (expandable to 104,400), Canon's EOS 6D Mark II succeeds not only in capturing the Milky Way, but does so within a reasonably portable chassis weighing around 765g. Complete with a fully articulating touchscreen, it's a great ‘first’ full-frame DSLR for those wanting to take their nightscapes to the next level – and our top pick for the best astrophotography cameras for beginners. A second-hand version of the first-gen Canon EOS 6D is also worth considering. Until the Sony A7 mirrorless camera came along, the best astrophotography cameras were all about DSLRs. The camera's latest iteration, the Sony A7 III, takes low light performance on by marrying a full-frame sensor with very high ISO capabilities. Its 24.2MP full-frame Exmor R CMOS and ISO 51,200 – which is expandable to a whopping 204,800 – are the main reasons why astrophotographers are fond of it (these very high ISOs even make it possible to video the night sky through a telescope using the A7). The camera's relatively small size (at 650g) and three-inch tilting touchscreen also appeal – the latter can be very useful when shooting upwards at the night sky. However, this camera is on our list because of its insane ISO. It's an expensive option though, particularly if you pair it with the Zeiss Batis 18mm f/2.8 wide-angle lens. To save cash, go for the Sony A7 II or the original Sony A7. The best choice for astrophotography and night-time landscapes is a full-size and very sturdy tripod. That's a shame, because the hobby usually requires walking off into the wilderness where equipment is at a premium, but it's nevertheless worth avoiding short travel tripods. That's particularly true if your camera doesn't have a tilting LCD screen, because you're likely to be pointing the camera upwards. However, you also can't afford for a gust of wind to ruin a long exposure photo. Weighing 2.4kg, the Vanguard Alta Pro 263AB tripod has three sections (the fewer sections, the better) and a ball head that rotates through 360 degrees. It also includes a quick-release plate and handy bubble levels. If you want to photograph the night sky, the Milky Way or a meteor shower, get a super wide-angle lens. As well as fitting in more sky to make composition much easier, fast wide-angle lenses collect lots of light and can be used to take much longer exposures than telephoto lenses before stars begin to blur. The Samyang 14mm f/2.8 is a 14mm lens with an aperture of f/2.8. Sometimes also sold under the Rokinon brand (in the U.S.) and available for Canon, Nikon, Pentax, Fujifilm, Sony and Samsung cameras, this is a manual lens that can easily be set to 'infinity' focus, and we think it's one of the best astrophotography lenses you can start with. It even has its own Flickr group. There's also a more expensive auto-focus variant (for using in daylight), the Samyang AF 14 f/2.8 lens, which was announced earlier this year. Earth's rotation means that the stars appear to move, so any shot where the shutter is open for more than about 25 seconds (the exact number depends on the focal length of a lens) will display blurred 'star trails'. You'll also notice that some objects that seem really bright to the naked eye don't end up looking very good in your photos. The solution to both problems is a simple equatorial mount like the Skywatcher Star Adventurer, which sits between a tripod and a camera, and moves in sync with the Earth's rotation. It means you can point a 600mm lens on a DSLR at a target like the Andromeda Galaxy and open the shutter for 90 seconds. The result is no star-trailing, and a bright image of a distant galaxy. The only issue is that all equatorial mounts need to be aligned to the star Polaris – it's not difficult, but it takes some practice. You should always use a remote shutter release – either wired or wireless – to prevent vibrations when opening the shutter for a long exposure. However, if you want to take a series of timed exposures (perhaps to produce a star-trail image) and don't have the in-camera ability to do so, an external intervalometer can be really useful. Explicitly designed for DSLR time-lapse photography, they enable automatic shutter triggering; but swerve the big brand attempts since this is a commodity market. You'll see brands like RGBS – we like the RGBS LCD Time Lapse Intervalometer Remote Timer Shutter – QUMOX, Neewer and Jintu online, but they're all essentially the same product. You get an exposure count, an interval timer so you can leave a gap between each image (handy for letting the sensor cool down for 15 or so seconds between shots, especially on a crop-sensor camera), and you can take single exposures lasting as long as you want. Another star tracker mount much like the Skywatcher Star Adventurer, the iOptron SkyTracker is another reasonably affordable way into either long-exposure astro-landscapes, or 'deep sky' astrophotography using a zoom lens. Able to fit directly to regular photography tripods, and able to take a camera and lens weighing up to 3kg, the SkyTracker Pro has an illuminated polar scope for precise alignment with Polaris, the North Star. It's best used with the TS-Optics Ball Head TS-BH-51AT. Great targets for DSLR cameras on star tracker mounts include the Andromeda Galaxy and Perseus Double Cluster – both rising in the east in autumn – and winter's Orion Nebula, just below Orion's Belt. If you do have a telescope, or you think you might have occasional access to one, a cheap T-Ring Adapter is a useful addition to your astrophotography kitbag. A standard screw mount for cameras that screws on in place of a lens, it enables a DSLR body to be attached to a telescope. The Celestron 93419 T-Ring Adapter, from telescope-maker Celestron, has a T-Ring specifically for Canon cameras, but the Celestron 93402 is also available for Nikon cameras. To attach it to a telescope means adding a T-Adapter uniquely designed for specific telescopes, which a telescope-owner will usually have. If you just want to photograph the moon, a great alternative is to just put your smartphone up to a telescope’s eyepiece; it’s easy enough to do free-hand, but the Carson HookUpz 2.0 Universal Smartphone Optics Adapter makes it even easier.